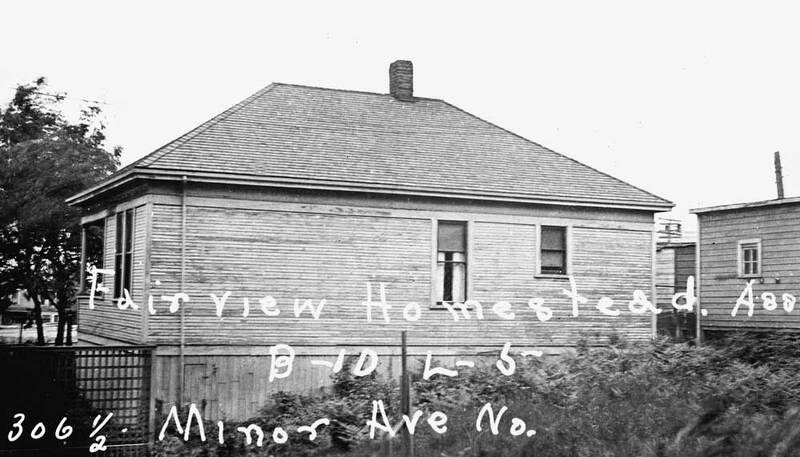 For a moment, only, this historical photographer paused on Minor Avenue about 40 feet north of Thomas Street and aiming east snapped this official record of lot 5 in the tenth block of the Fairview Homestead Association’s addition to Seattle. 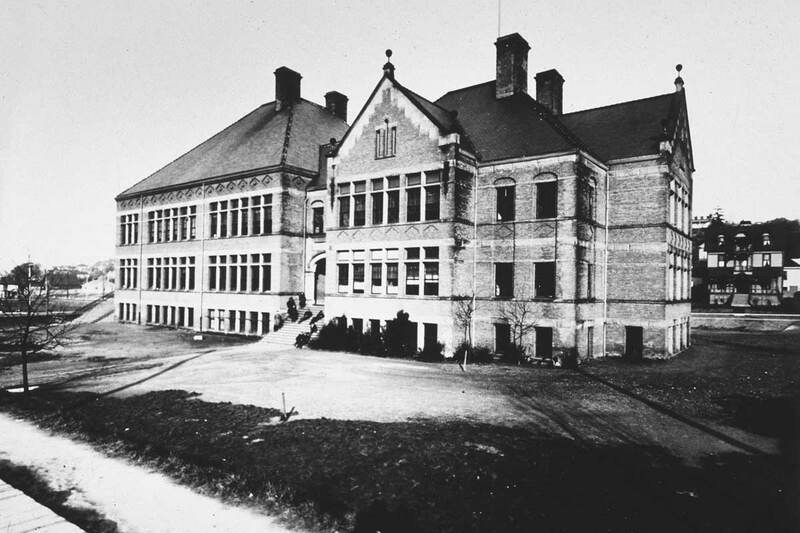 The addition was filed in the mid-1880s but the photograph was taken in 1937 as part of the depression-time Works Progress Administrations picture-inventory of every taxable structure in King County. 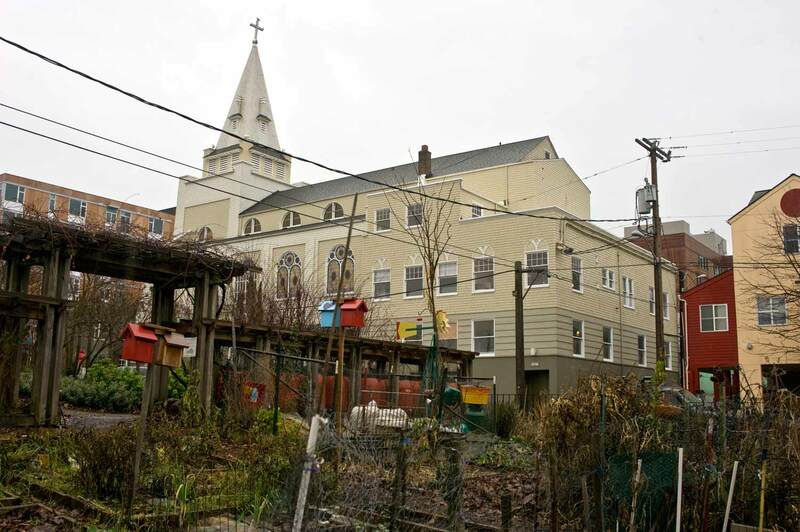 The tax assessment here was not very high for these are four nearly identical 900-plus square foot homes squeeze onto one lot, the second lot north of Thomas. The tax card indicates that they were built in 1900. (Perhaps, but they do not show up in the ordinarily trustworthy 1912 Baist Real Estate map.) 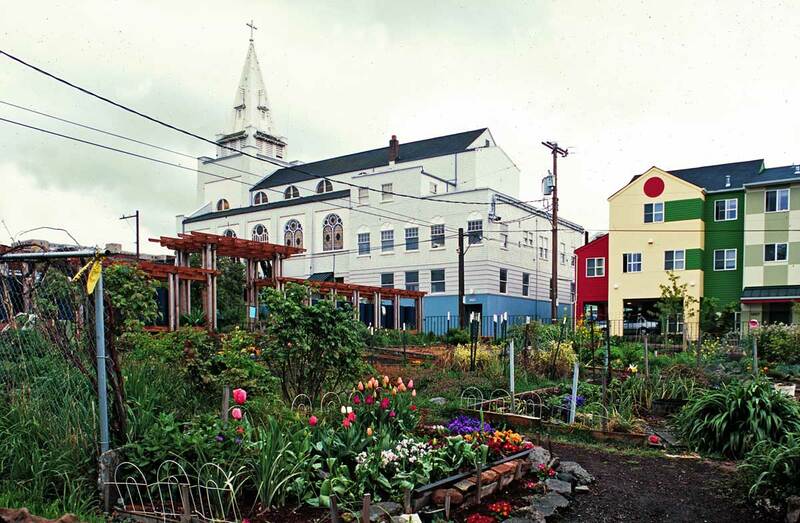 The intentions of the original pioneer developers were to help working families stop paying rents and start investing in their own homes. Innovative installment payments made the lots affordable and many of the homes were built by those who lived in them, although probably not this quartet. 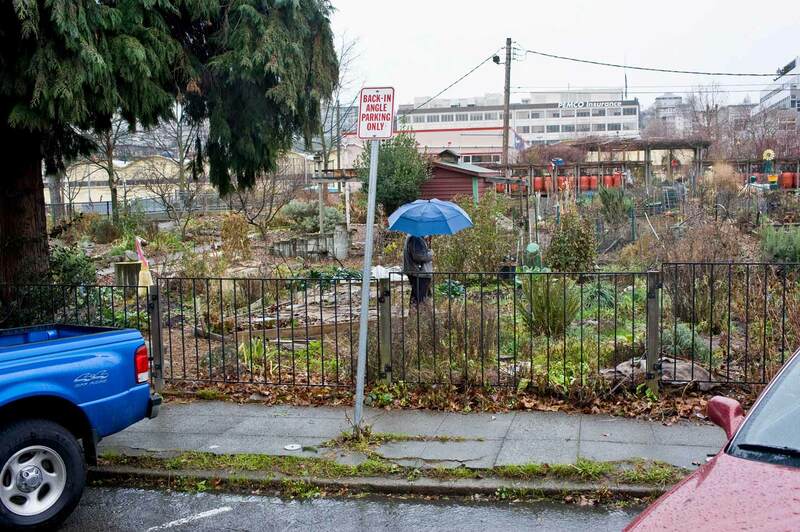 If we may trust the 1891 Birdseye view of Seattle – and it is splendid to study – Minor Avenue was then part of a shallow ravine or very near it, which gathered run-off in this Lake Union watershed. 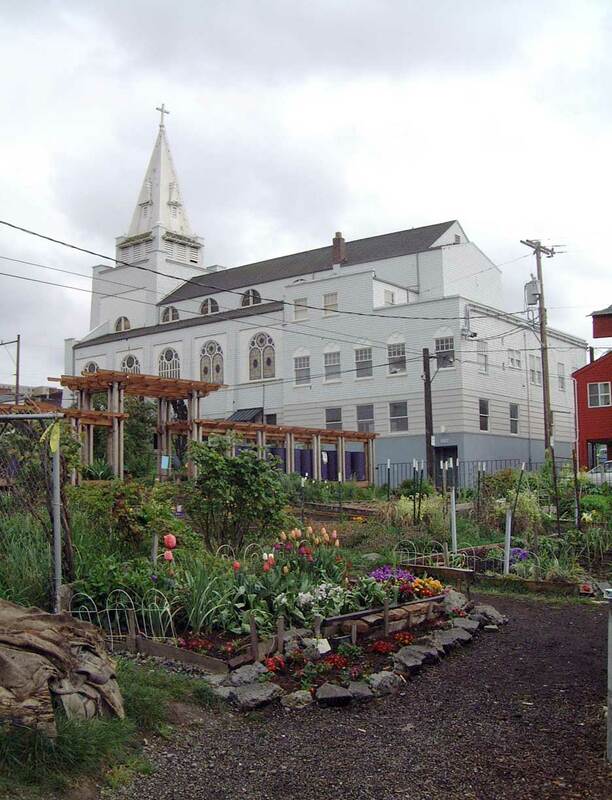 And since 1996, as part of the Cascade Neighborhood’s public garden that spreads 50 lovingly tended p-patches across this 7000 sq. ft. corner, rain water for the garden is collected into big barrels from the roof of the nearby Cascade Peoples’ Center. 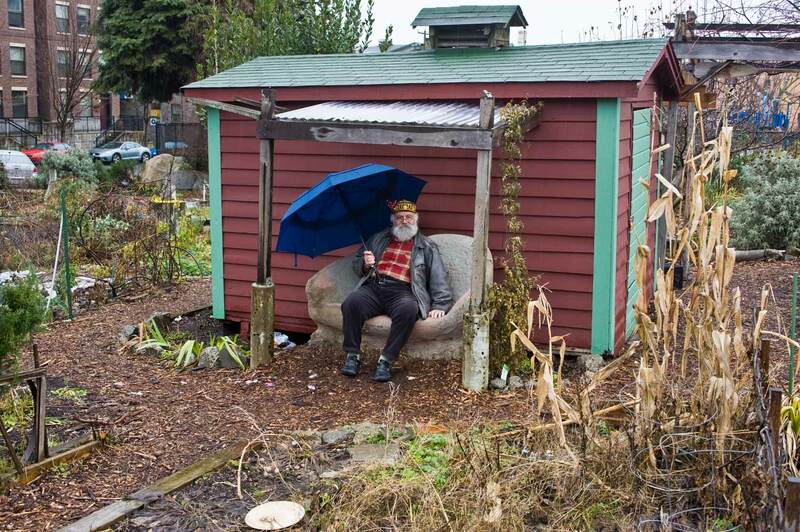 Jean writes: Visiting this sacred corner of Paul’s personal history on a sodden day at the end of December was a mini-revelation. 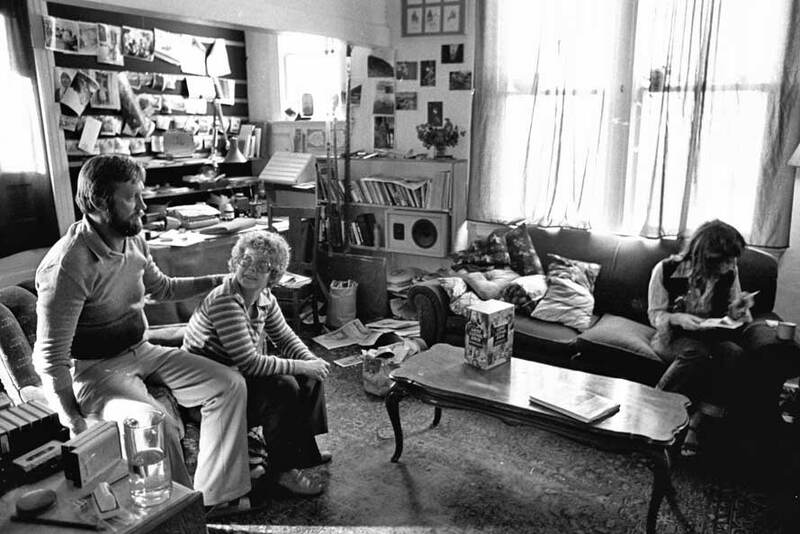 Here, Paul lived with his dear friend Bill Burden (whose wise and scintillating blog can be found here and through the button ‘Will’s Convivium’ at upper right) and I snapped him looking bemusedly from the spot he identified as having once contained Bill’s room. 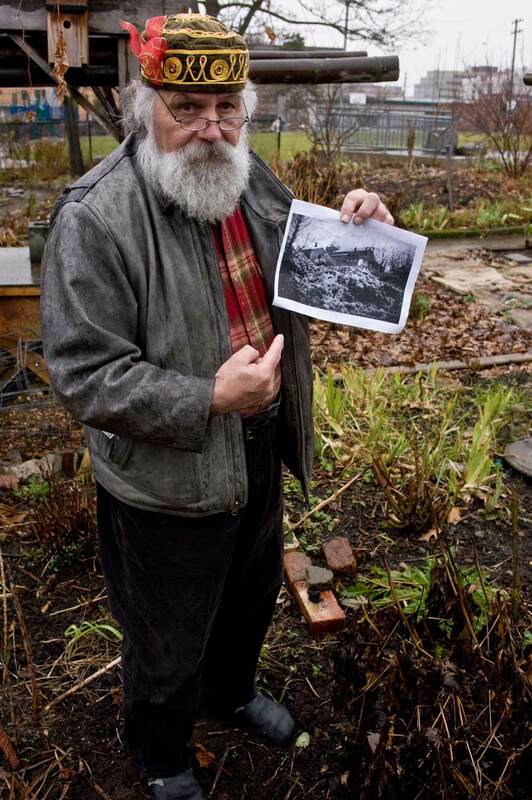 Paul brought along a photo he’d taken from his own bedroom window of the church across the road. We include it again, below. Anything to add, Paul? Or to correct? BLOG EXTRAS we call them Jean. And yes I have a few – a slew even – of other pictures that catch this corner or nearby. I will given captions for them, but little ones I hope. I have also written a few now-thens (other ones) about landmarks within a block of this corner but I’ll not include them here. I mention that only to inspire longing in the reader or readers if we have more than one, which is to say more than you. 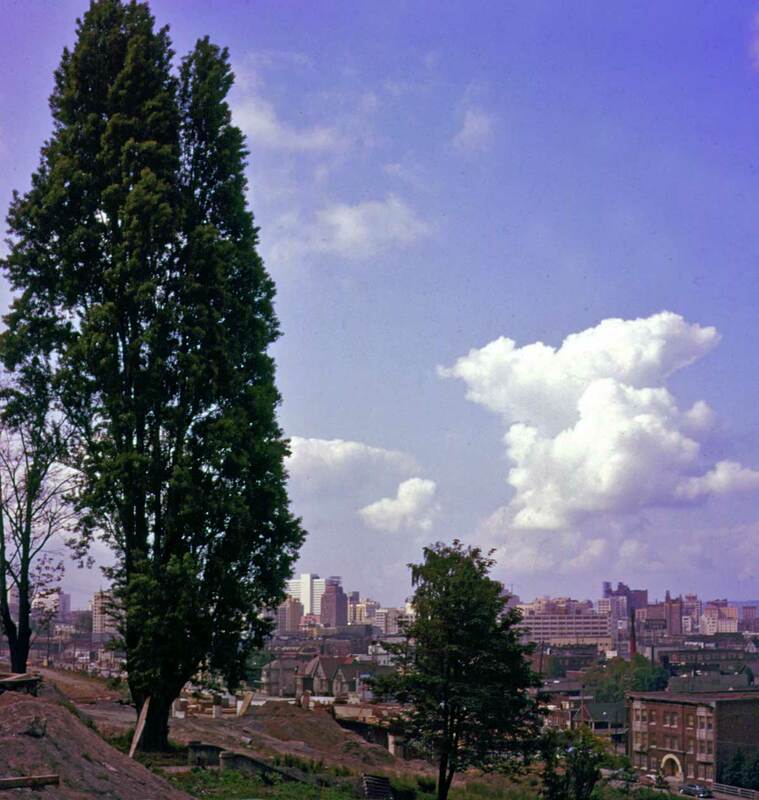 I’ll begin with two of the south side of 306&1/2 Minor, where Bill and I lived in the late 1970s. My desk – with its Selectric typewriter – sat at the larger of the windows on that wall. I looked out across the vacant ans sunken blackberry snarled corner lot to Thomas Street, and to the left of Thomas still stands Immanuel Lutheran Church. 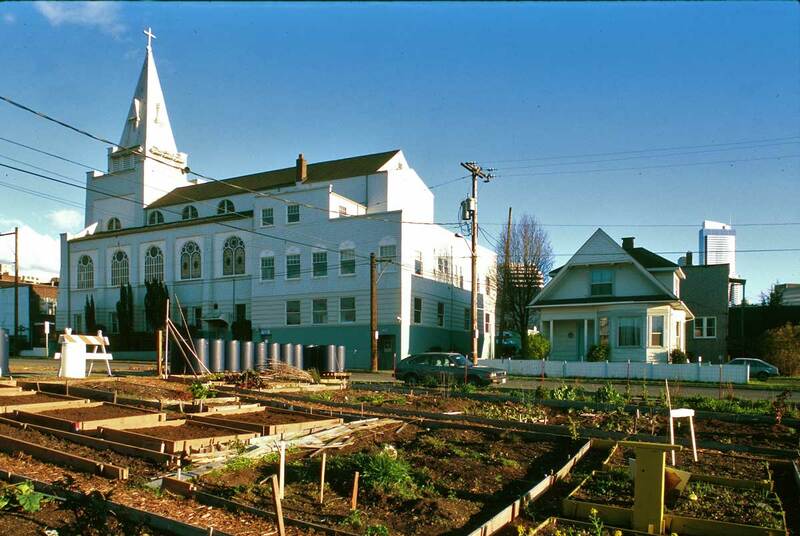 After the views of the window, I’ll place one that looks from it to the church on a night of snow, then others photographed in the late 90s and early 2ooos of the p-patch development. I will date them as best as I can. I believe a highlight of what follows will be my snapshot of Bill trucking down the Minor Avenue sidewalk. 306&1/2 Minor North looking north from Tomas, ca. 1938. A tax photo. 306&1/2 Minor in 1958 with "War Brick", a popular asbestos covering sold by door-to-door salesman in the 1940s. 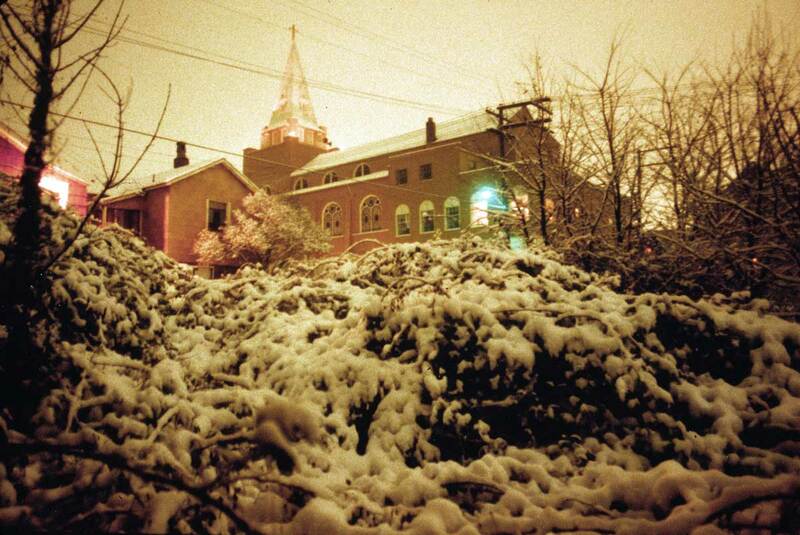 Looking from my bedroom window to Immanuel Lutheran Church on a snowing night of the 1977-78 winter. April 2001. The lot has been raised to street grade. When I lived there it was a pit deep enough for a basement but not necessarily built for one. 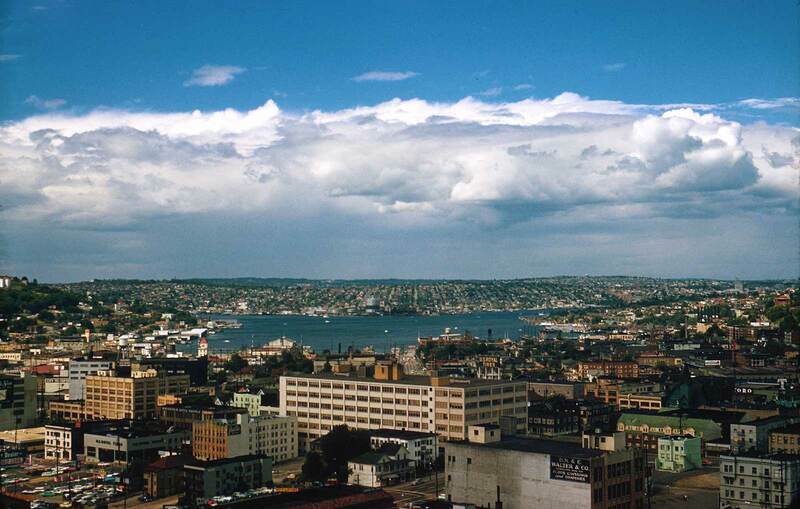 Next, I'll put in a 1891 birdseye that shows a ravine here or very near here that ran south towards Lake Union. 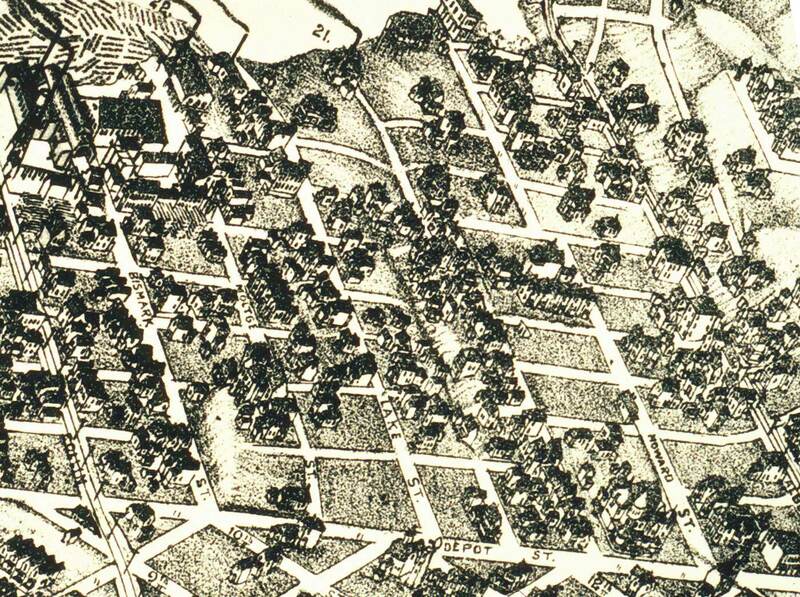 Cascade neighborhood detail from the 1891 Birdseye View of Seattle. Depot St., since renamed Denny Way, runs along the bottom border. Lake Union at the top. Eastlake is far right with the trolley tracks. Rollin, now Westlake, is on the far left. Near the center a ravine runs north-south from Thomas Street towards Lake Union. The big house hanging there above the east (right) right side of the ravine is near the northeast corner of Minor and Thomas, the P-Patch corner. 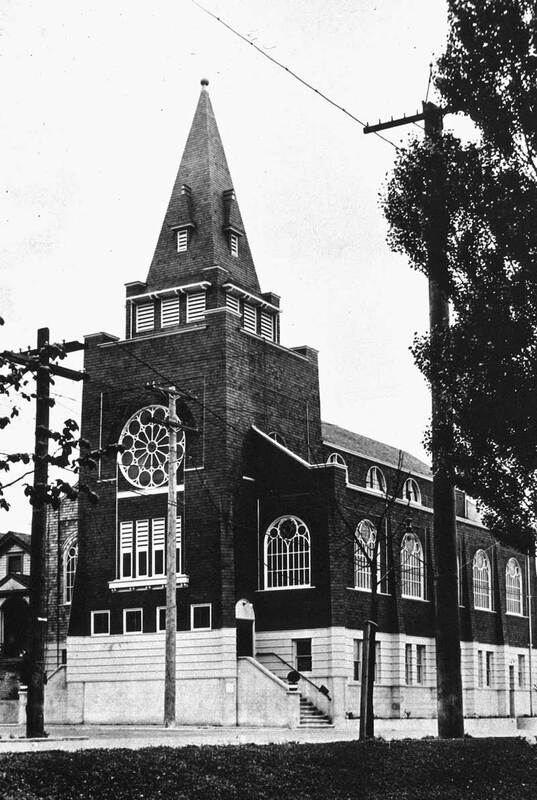 Immanuel Lutheran at southwest corner of Thomas and Pontius, early 20th Century. 2001 pan of the corner from Minor Ave. sidewalk looking southeast with Cascade Playfield on the left and the corner of Minor and Thomas, far right. 306&1/2 interior with the door to my bedroom behind me. I am looking northwest to Bill's desk. Bill's bedroom was off-camera to the left, and the kitchen to the right. Bill did the cooking, and fine cooking it was. Jan and Jack Arkills, old friends visiting from Spokane are on the left. Paula Calderon Kerby is on the right writing a letter it seems. Paula and Bill head for faux stairway to Cascade Playground on Minor Avenue. Our home was to the right. 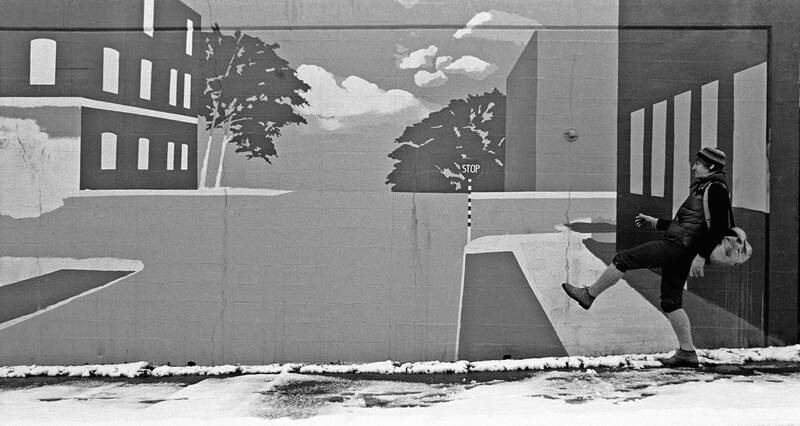 1977 snow. 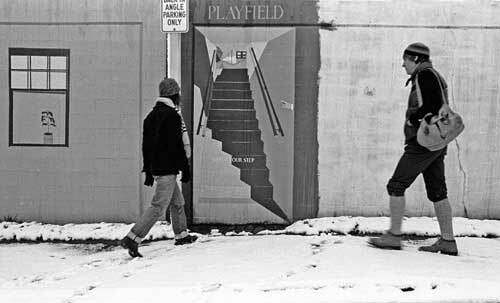 Unable to reach the Cascade Playfield by its Ceta Mural stairway (ca 1975 Seattle Arts Commission granted creation) Bill Burden continues to truck north on Minor Avenue towards Harrison Street. Stairway off Minor Avenue to Cascade Playfield twenty-two years later & still in good enough repair. 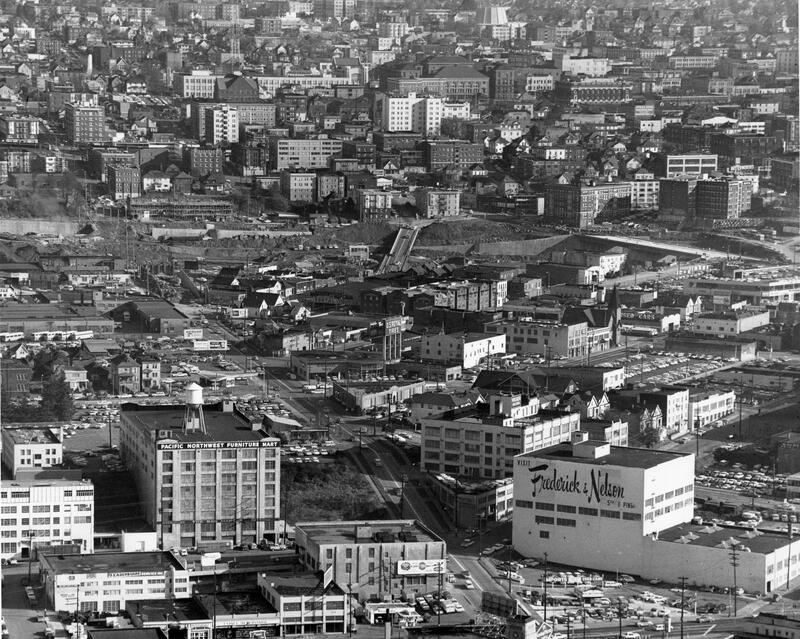 Looking north from the Roosevelt Hotel over the Cascade Neighborhood to Lake Union in 1959. Still no hint of the freeway. Immanuel Lutheran (painted brown) can be seen but with difficlty - about one-fourth of the width of the slide to the left of its right border. The landscape on the distant north shore of Lake Union (in Wallingford) is a half century younger here than now, and its relative lack of verdure shows. The houses - their roofs - still dominate the 1959 scene. Freeway construction looking south from near Republican. Photo by Frank Shaw, 5/30/62. Only now do I notice that at the bottom left-of-center is part of the stonework on the old Republican Street Hill climb that for pedestrians once extended from Eastlake up to Melrose and so through the steepest part of the climb from the Cascade neighborhood to the attractions of Capitol Hill. 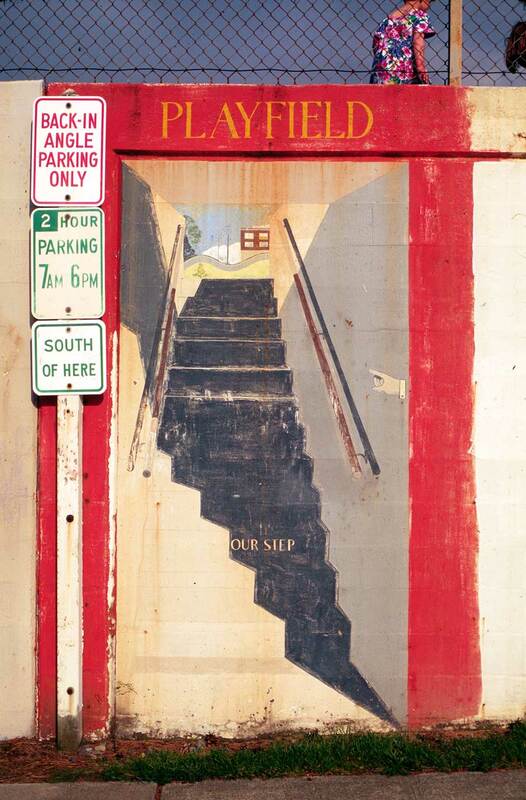 Also by Frank Shaw - Freeway construction sometime later. 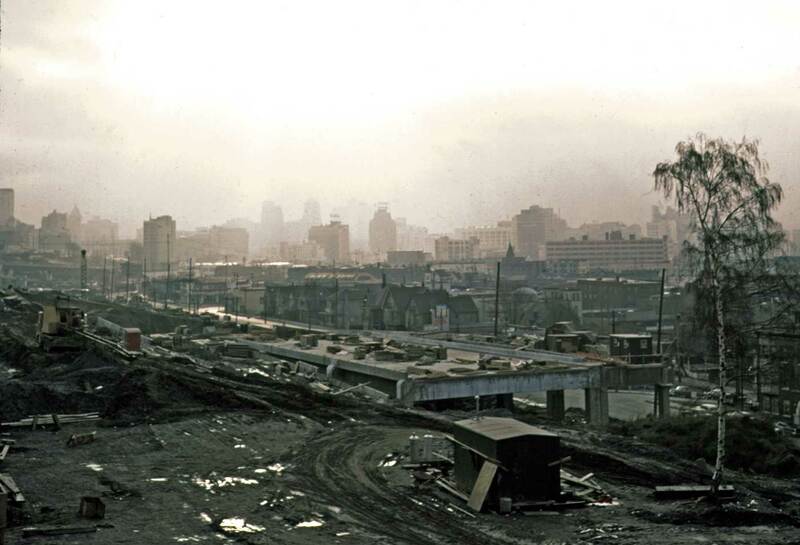 Another Frank Shaw of the I-5 "Seattle Freeway" construction. 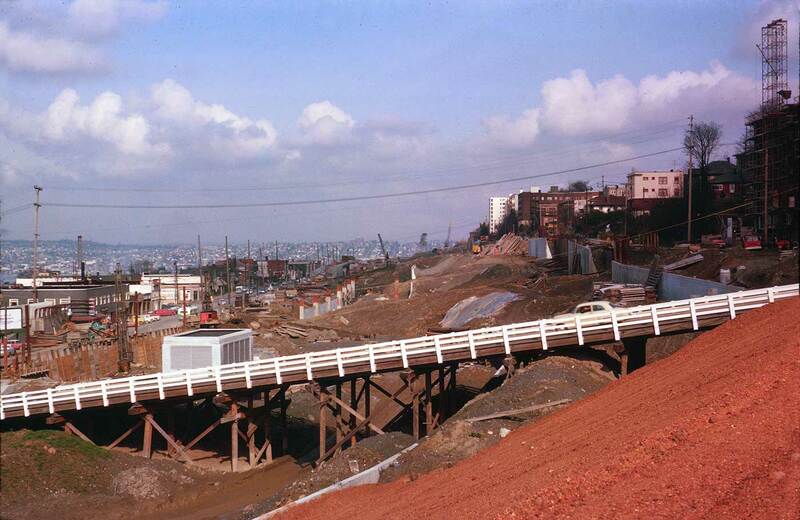 This one looks north from near Olive and over the Denny Way temporary timber trestle (I believe). It dates from 1963. Cascade neighborhood and beyond it the I-5 freeway construction effectively cutting off the Cascade neighborhood from Capitol Hill. 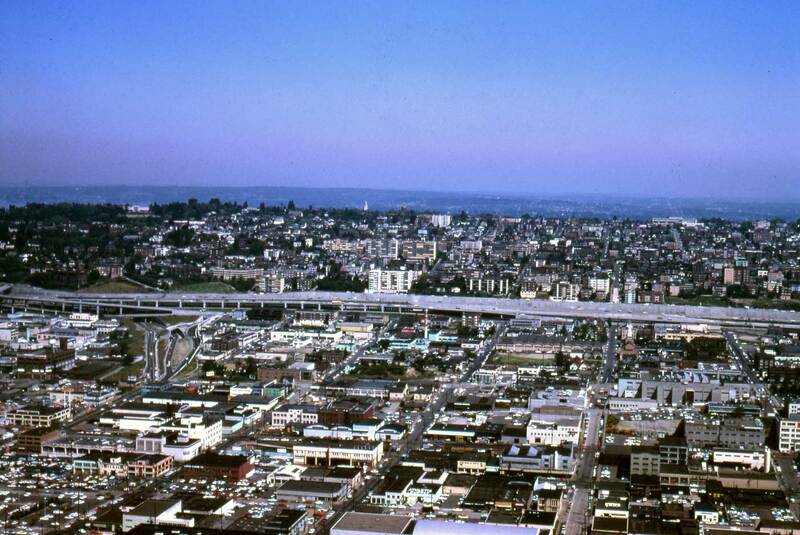 Photo taken by Robert Bradley in 1967 - as seen from the Space Needle. 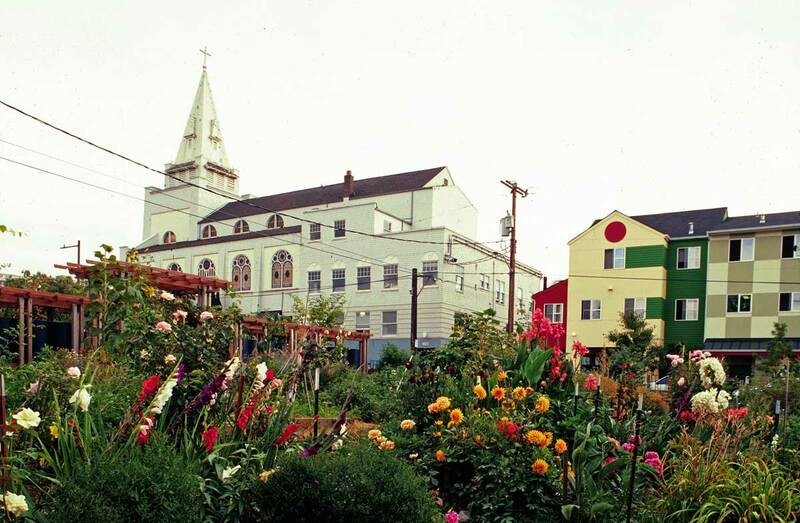 The green lawn of the Cascade Playfield can be easily found right-of-center. Thomas Street rises from the photograph's bottom border about one-third of the way across it from the right side. That is all for now Jean. Is it too much? When I find one of Cascade School I’ll attach it. FOUND the school Jean. Twice – back and front. And another looked at Bill on site in 2006 at the bottom. 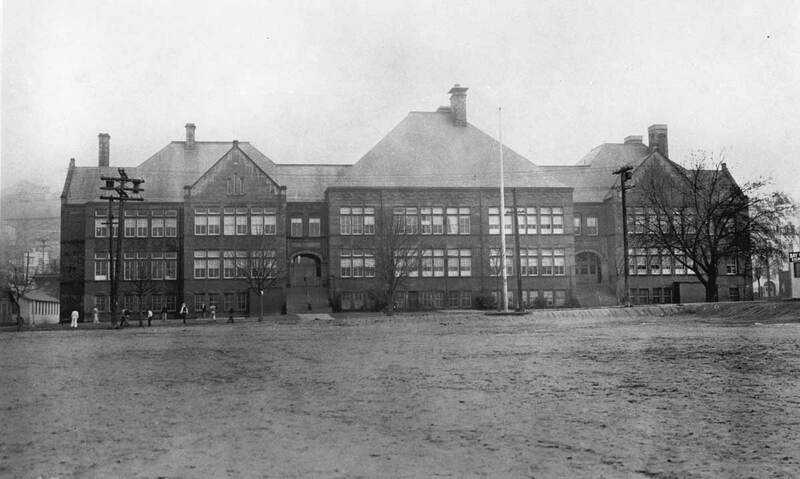 The source of the Neighborhood's name, Cascade School backside looking west. A south wing on the left has been added. This new one was taken by Berangere - of this blog - in 2006 when both were visiting: the one from Paris and the other from California. 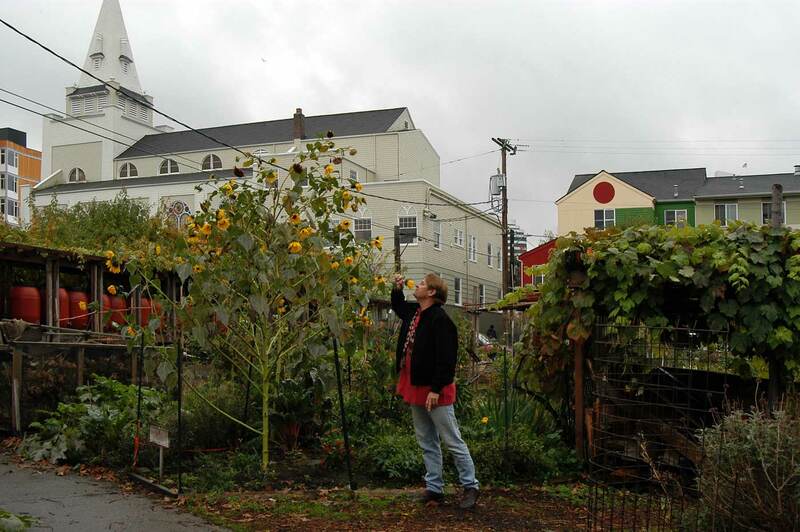 Here is Bill smelling and perhaps preparing to buss a sunflower in the Cascade P-Patch and not far from where his bedroom was comforted him at night. I was able to find your house (306 1/2 Minor) and this block using SPL’s online access to Digital Sanborn Maps. Volume 4 (1905-1950), sheet 485 shows four houses and a small garage (behind your house) on this lot (306-310 Minor). 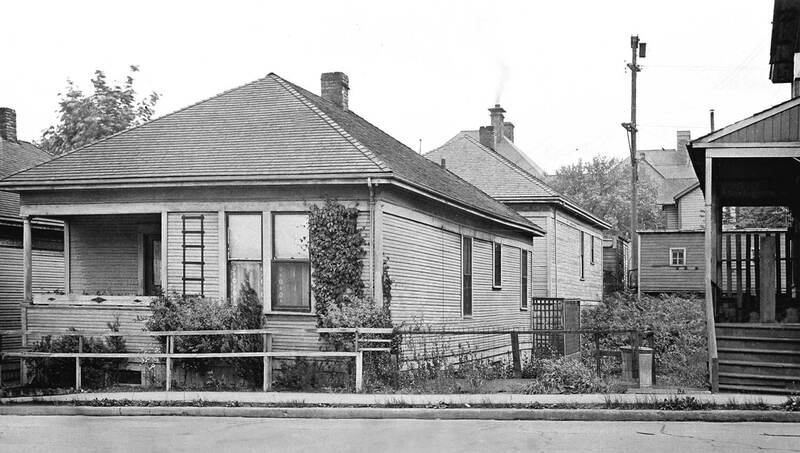 The lot on the southeast corner (301-305 Pontius) had five houses and the third lot to the north (315-317 Pontius) shows six! They must have been 300-500 square feet each! In this case, Sanborn offers no resolution to the question of the build dates, but provides a nice footprint. Cascade is one of those neighborhoods between neighborhoods many of us didn’t recognize until the city began designating everything with signage. 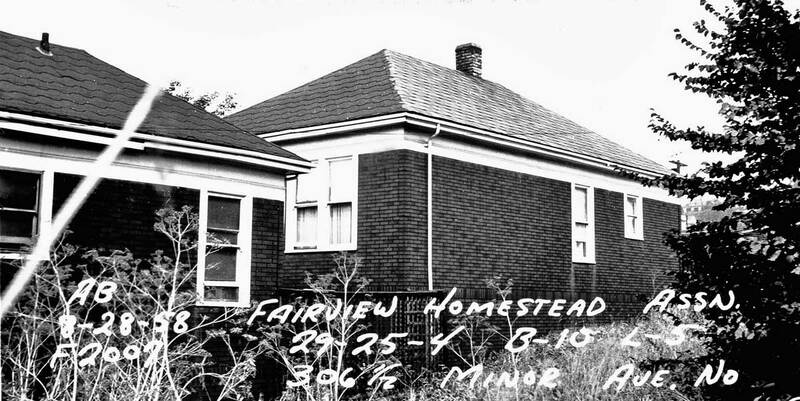 A significant neighborhood history waits to be told, I suspect. I’ve never identified a Cascade neighborhood movie theater. 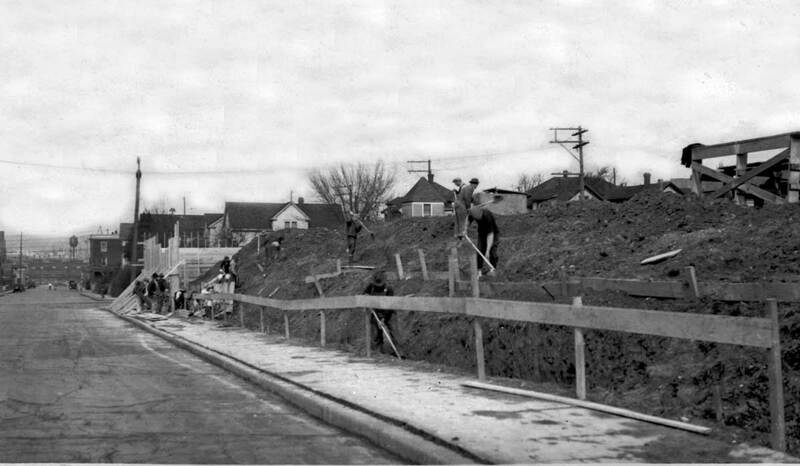 Wasn’t there a professional baseball field nearby before Dugsdale built in the Rainier Valley?